Ever since that moment, which preceded the moment where I discovered how well-lubricated an intestinal tract can become, I knew I had to one day drive a Zamboni. Sorry, I mean Zamboni Ice Resurfacing Machine because that’s what the Zamboni company likes to demand people call these things, which, of course, nobody ever does. Anyway, my chance finally came to drive one. Thanks to the generosity of the New Jersey Devils (they even gave me a jersey with my absurdly long name on it!) I finally had an opportunity to realize my Zamboni dreams, and I’m delighted to say it was worth it. It’s as good as it seems — like driving a 10,000 lb Miata with a severely restricted throttle, towing a massive, incredible sharp and dangerous blade, while sitting on a stepladder inside the car, all on tires with massive studs, on ice. It’s that good. So, for all of you who were like me, growing up with posters of famous Zambonists on your wall (Malcom Towbridge! Randal Pretzgibbon! Claudia Exivanti! 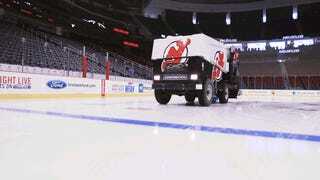 ), I hope you’ll find this little taste of the Zamboni life gratifying. Plus, if you’re paying attention, the next time you’re at a hockey game or an Olympic figure-skating competition, and the Zamboni driver falls ill from food poisioning, you’ll be ready to save the day!